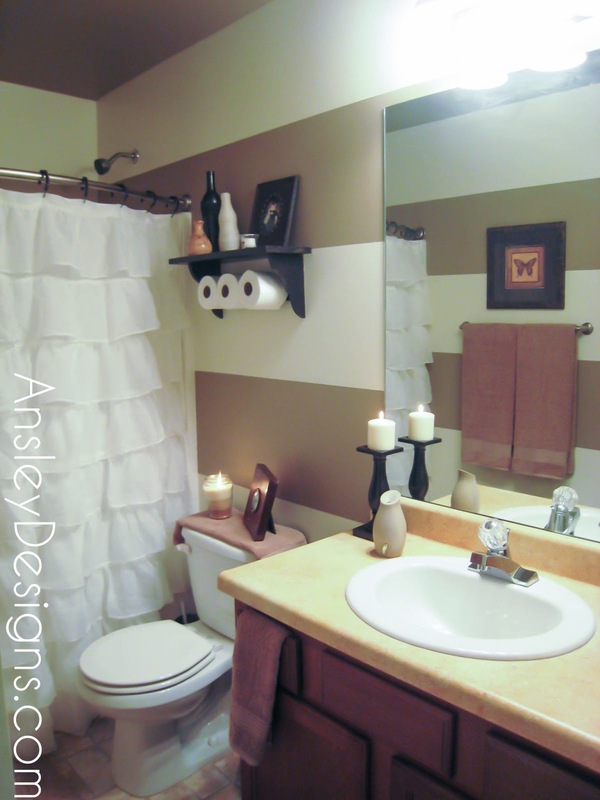 Ansley Designs: How to Paint Stripes on TEXTURED Walls! 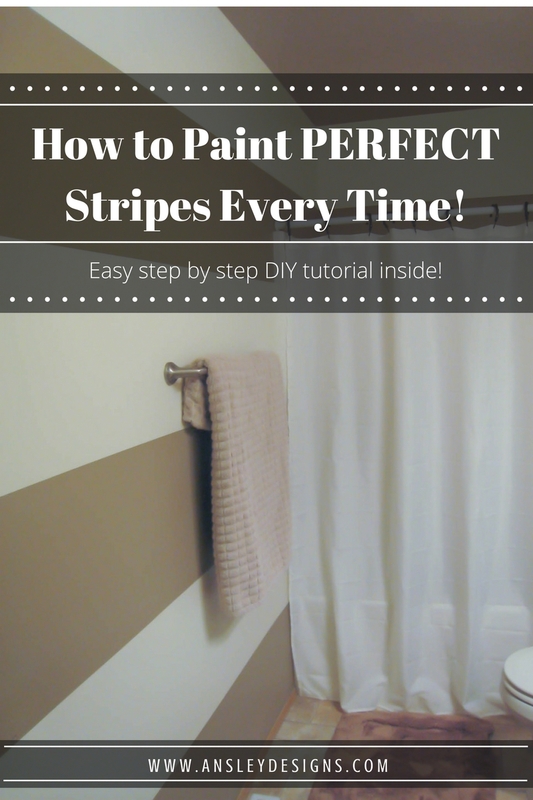 How to Paint Stripes on TEXTURED Walls! I have been a busy gal! During our Snowmageddon I was going completely crazy wanting to get to the store for some things I needed for projects. Alas, the roads were all icy, and Washington was even put into an official state of emergency. The only emergency here was me needing something to do! I racked my brain for an idea of anything that I've ever wanted to do - that I actually had the materials for. 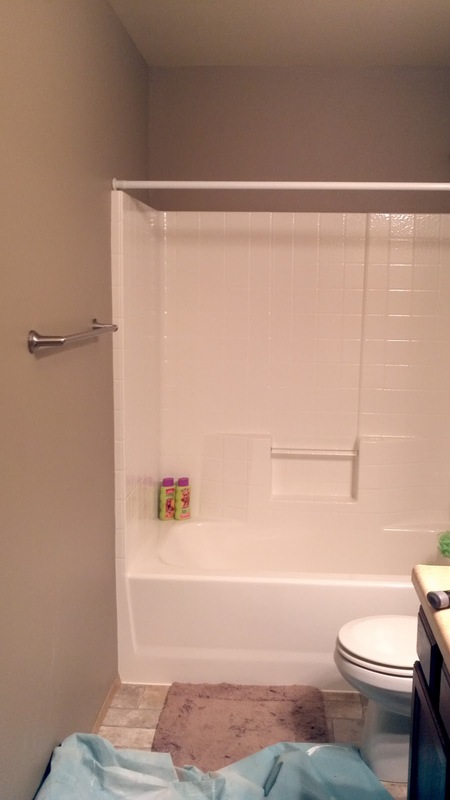 As it turns out my son's/guest bathroom was the unsuspecting victim. So what did I do? Here's a subtle hint.....STRIPES! Now, this room didn't start out with me thinking "oooh stripes". 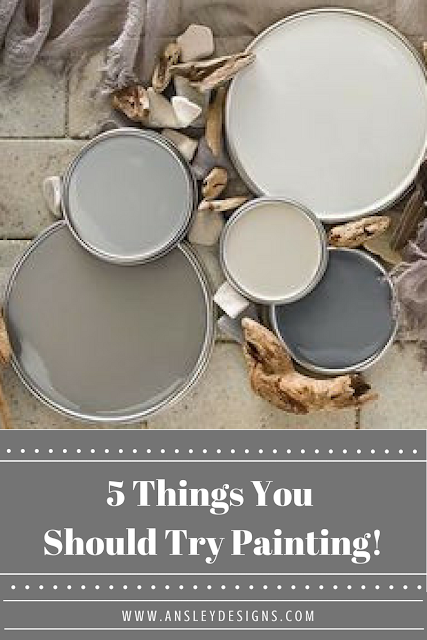 I first thought, "Ohh I have brown paint leftover from the living room, and it will look better than the creamy, neutral, yellowy, ugly color in there now!" So, I painted the entire room brown. It already looked a lot more inviting. 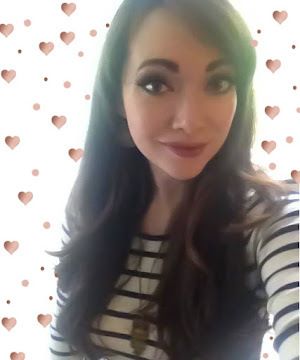 Then, after being kidnapped for hours by beautiful design photos on the internet, I decided to celebrate my freedom by making inspiration a reality! Here is the room before (sort of)...I get a little overzealous and frequently forget to take before photos, before I actually start! First, begin by painting your base color, and allow it to dry completely. I suggest starting with the lighter of the two colors, which I did not do because of the nature of this project's evolution. Thankfully, the stripes ended up only needing two coats anyway. Next, determine how many or how large you want your stripes to be. I wanted large, horizontal stripes, I ended up settling on 6 of them. 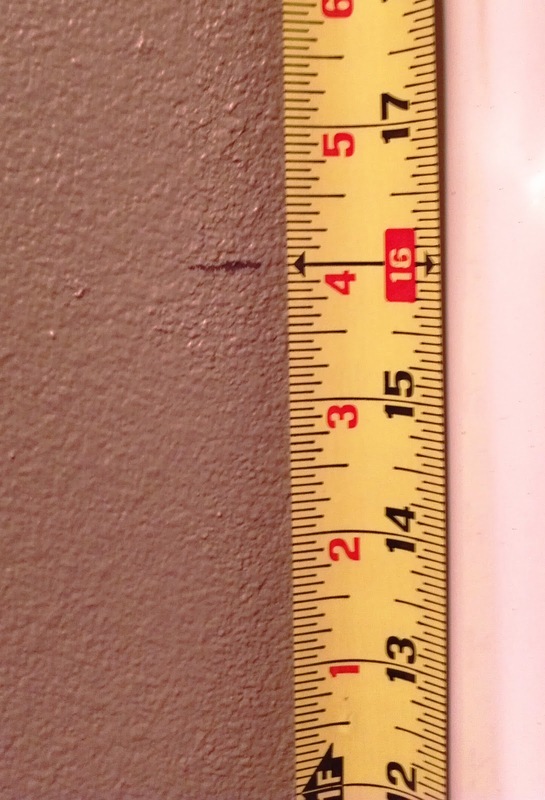 My walls are 96 inches (8 feet) tall, divide that by 6, and that gives you 16. Voilà, each stripe will be 16 inches tall. You would do the same thing with the width of your room if you desired vertical stripes. Two coats of my base color. 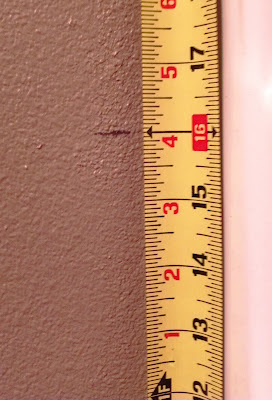 Next I measured each end of the room, using a pencil to mark every 16 inches up the wall. Using a chalk line and my handy DIA (do it alone!) skills, I taped the retracting end of the chalk line to one side of the wall directly on the pencil mark. Once secure, I pulled the line to meet the mark on the opposite side of the wall. A little POP of the string, and there's your chalk line. Repeat this for every marked area that will form a stripe. UPDATE: I realize now that the chalk line part was totally UNNECESSARY! It just added to the mess. 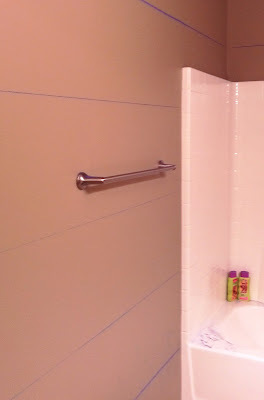 After you measure your marks around the wall, just go ahead with your painters tape, then continue on! Once you have your perfectly straight chalk lines, begin taping. Simply tape over the chalk lines. Be sure and alternate so that your stripes are the same height. i.e. for the first line, tape over the chalk line, and the next line tape under it. Rinse and repeat. At this point your future stripes will appear uneven. However, this ensures that the actual part you are painting is the proper size - in my case 16 inches. Before applying any paint, I gave the tape a quick wipe down because I didn't imagine that paint would adhere well to the chalk that was still on the wall. 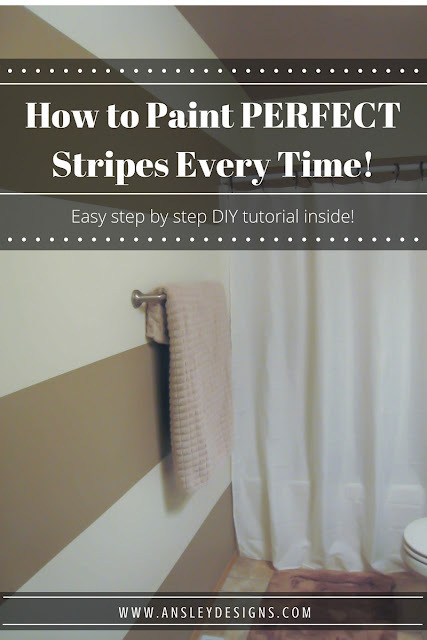 I was super nervous about painting stripes because my walls are textured. However, this next step ensures a perfectly crisp line! With your handy dandy paint brush, paint the base color along the tape line that you will be painting the second color. This step is crucial! 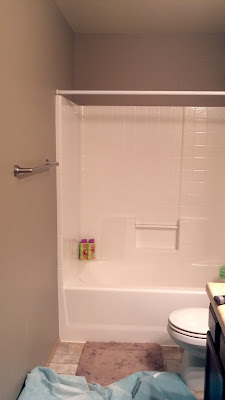 Any drips behind the tape will not only give it a better seal to those horrible textured walls, but what does seep behind the tape will be the same color. I applied two coats in this manner. You might be able to get away with one, but I did not want to chance it! Tape up, sporting two coats of the base color along the seams. Yes, that is a chalk graveyard in the corner from my brand new chalk line! After the first couple of inches of tape removal...I was in love! This is the absolute best part of the project!!! Upon seeing the glorified, perfectly smooth, straight line that was my stripes, I smiled the whole time removing the tape. I think I may have even called the walls my baby. "Mommy will take care of you. Yes!" Don't be afraid of stripes! With the proper steps, even textured walls can boast a crisp striped attitude!